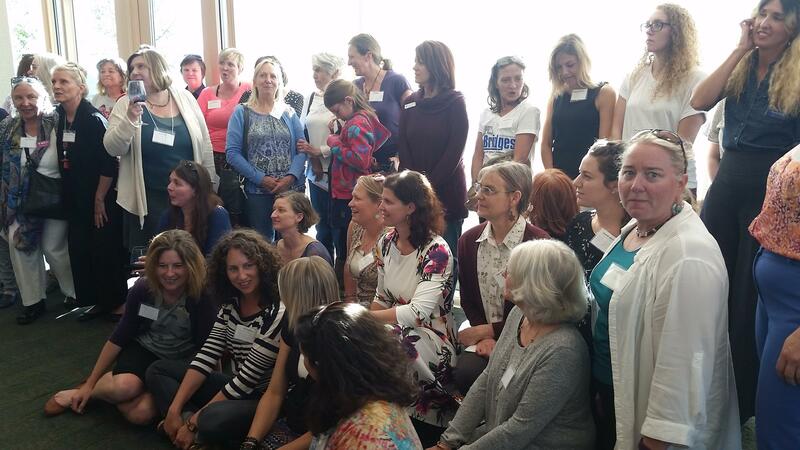 Attendees at the kick-off event gather for a group photo after learning about the Women's Giving Circle. Women in Missoula are trying to figure out how to be more effective at giving money away. Jen Euell, director of the Women’s Foundation of Montana, thinks women giving together can have more impact than making charitable donations on their own. Last night, her organization and the Missoula Community Foundation invited women to be a part of a new effort, the Women’s Giving Circle. About 70 women gathered on the top floor of Stockman Bank last night to hear about it. Euell and others in the foundations have been working on the idea for a few months now. They’re focusing on bringing women together to make charitable donations to local organizations. The idea is modeled after similar groups around the globe. Euell highlighted statistics about women’s giving during the event, including how women donate more of their income compared to men. Women are also interested in having a relationship with who they’re giving to, which includes volunteering and collaborating with groups. “What I like about this group is that the sole purpose is to gather together and identify problems in our community and look at ways that we can focus on the solutions," said Shannon O’Brien, who came to last night's kickoff event. She works at a consulting business for corporate trainings and wants to get involved. One of the first goals is for the group to engage at least 100 women. They want to give a $10,000 grant this November to a nonprofit group that supports women and children. Giving circle participants will vote on who gets the money. They’re hoping the group will grow and be able to give more often and to more organizations. The Women’s Giving Circle is planning another event in August. You can learn more about it by clicking here and here.